Presented here, a fine Mahogany Cutlery Tray with Whalebone Trim and Handle, measuring 13 inches x 10 inches x 7 inches. 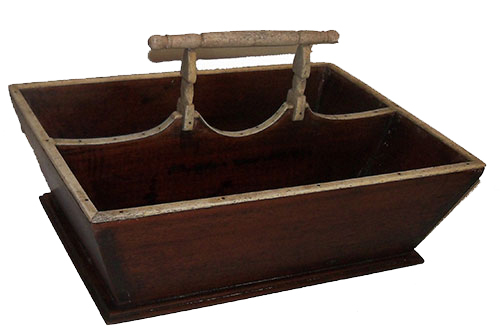 The tray is of very fine construction and is very finely dovetailed. Most certainly a gift made by a whaler for a mother, wife or sweetheart. Certainly an item to be admired and used by the recipient and a fine example of the art of the Scrimshander.